"Holy, holy, holy, Lord God of Hosts, heaven and earth are full of your glory. Hosanna in the highest. Blessed is he who comes in the name of the Lord. Hosanna in the highest. " 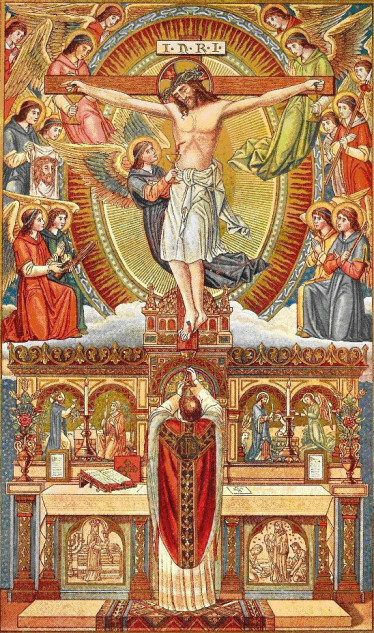 At this moment in the Holy Mass I can see where the throne of God is, although I cannot see God, and I can see all of the angels and the Saints worshiping God around His throne. All of the universe is united in worshiping God at this moment. All of the angels in heaven, all of the souls in Purgatory, every soul united with God is worshiping Him at this moment. Human words cannot fully describe the joy and worship that is experienced in Heaven before the throne. 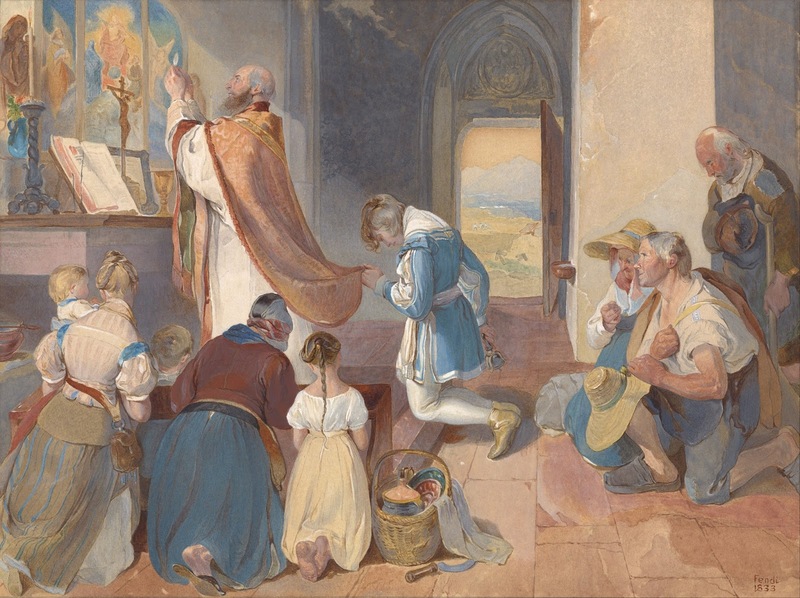 This is why the Holy Mass has such an effect on every soul on the earth. Because through the Holy Mass we participate in this Holy and Pure worship around the throne of God. Only a Priest in good standing with the Church can open this door to heaven for us. To stand in the breach and be on earth but to be able to open heaven is a gift of the male Priesthood from the beginning. No woman could withstand what is required and if for some reason the Pope where to ordain a woman to be a priest, he is signing her death warrant, for the first Holy Mass she would try to celebrate would mean her physical death. I know what the Holy Mass is. I go to Holy Mass because I love God and I love others. Having brushed the edge of eternity by God’s grace I live in a state of constant mourning for the souls that are constantly choosing hell. God has let me know the state of souls in the world and He does not desire any soul to go to hell, but many because of lack of love, selfishness or just plain evil choose it DAILY. Yes, souls are falling into Hell and will be there for all eternity as you are reading this. They shall NEVER get out. God does not leave us unaided, but who will receive the truth and not push it away? Many receive graces from God and just push it away. I didn’t, I went after Him, pursuing His mercy for others. God is not far away, and He WANTS TO BE FOUND. As a result God has shown me the tools that He has given to mankind that can be used to seek His mercy for others. Why do you go to Holy Mass Catholic? Do you go because your family goes to this Church? To see if someone else showed up or what someone is wearing? Do you go because it is ‘what you have always done’? Because you went to School at the Parish? That may be all well and good, but that is not your mission as a Catholic . If you love God, great, seek your salvation and the salvation of your family, but I enjoin you to broaden your horizons beyond your own family and parish and seek the salvation and the good of the Muslim, the Atheist, anyone that has been given to you. Seek their salvation by pleading to the throne of God for them during the Holy Mass and then take Holy Communion for them. This is what you are made for, that through you, the world is changed. Catholics in a state of grace seeking what is good first for our families and parish and then for another. Do not pour yourself out one drop less for the one who hates you as the one that loves you.